Meet Karma, a Kid for ColoradoGives! Karma Lynne is 10 years old. She’s a fifth grader, a Lakewood resident and a community volunteer. She’s also a Kid for ColoradoGives! Kids for ColoradoGives is a new program that allows young donors to experience the joy of giving. Community First Foundation created KidsforColoradoGives.org, a kid-friendly component of the ColoradoGives.org website, to connect the next generation of Colorado givers with local nonprofit organizations. This weekend, we interviewed Karma about her experience using the new site. Q. What did you think when your grandmother, Lynne Valencia, asked you to check out KidsforColoradoGives.org with her? A. I was excited to give money to places that help others. I never knew there were so many organizations in Colorado that do good. Q. Did you learn something new on KidsforColoradoGives.org? A. I really liked looking for organizations that help animals. That is where I wanted to donate. When I found the page, I got to learn about all the places that help animals heal and get adopted. There are places that help dogs, cats, birds, horses, goats and so many animals. I never knew that animals also help people heal, feel better and have a normal life. Q. How did you decide which organization to donate to? A. I spent some time reading the descriptions and looking at the photos. It was hard to decide. I love dogs and horses so that is what I looked for first. But then Grandma Lynne and I found some other organizations that worked with wildlife that I never knew about, so I gave them some of my money, too. Q. After you made your donations, how did you feel? A. I felt happy. I wished that I could go visit the organizations I gave to, because I felt that I was part of them now. Grandma Lynne and I are planning to go visit and maybe donate our time, too. Q. Why do you think giving to organizations that help others is important? A. It is important to give so they don’t feel alone. The people who work at the organizations should feel like others believe in what they are doing to encourage them to keep doing their work. It will make our state a better place. Q. How do you think young people like you can help your communities? A. We can help by giving our time, money and other things like dog food or beds. We can also help by being nice to each other and helping people solve their problems. Q. Would you recommend other kids use the KidsforColoradoGives.org website? A. Yes. I would let them know there are lots of choices and you can donate to whatever is important to you. For example, if you love animals, education, health, art, the environment…you can learn about them! If you’re ready to introduce your favorite kiddos to charitable giving, you can purchase Giving eCards at KidsforColoradoGives.org. 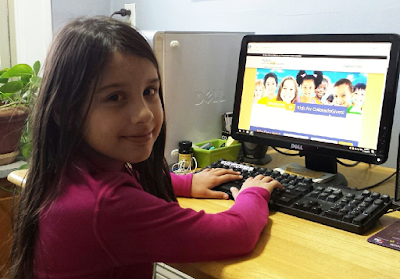 Kids then use the Giving eCard code to make online donations to a Colorado charity. Buying Giving eCards and making giving decisions as a family is a great way to pass down family values and inspire a lifetime of charitable giving.